Our Birthday girl started out the day with a little bit of TV (special treat) while we got dressed. 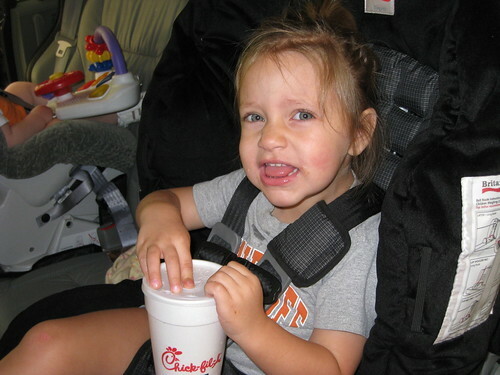 Unfortunately Daddy had a school commitment so after we waved goodbye, the girls and I loaded up in the car for a birthday breakfast at Chick fil a. We had decided to support our Vols today, and while Anne Marie was in a demure grey shirt with Tennessee written in orange, Ellie and I were in blinding Volunteer orange in the middle of Dawg Country. Brave. Very brave indeed. We got alot of looks that were hopefully due to our orange or the utterly adorable girls I had with me and not the fact that I looked a little like death warmed over having gone to bed late, not slept well, and not showered. Lovely picture, I know. Thankfully the only confrontation, if you want to call it that, was a high school boy, clad in a Georgia shirt, who told Ellie he didn't like her shirt. But we laughed it off and told them good luck... they wished us the same - I think we need it. 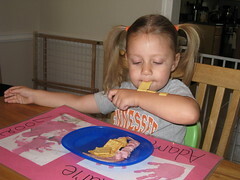 Many chicken minis were eaten by the birthday girl and for another special treat - cinnamon rolls. We had to come home for Ellie to take her nap, much to Anne Marie's chagrin. To ease the transition, she got to paint. Much fun. 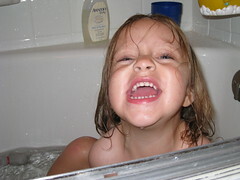 Then, so mommy could start this blog and get some chores out of the way, quiet time ensued. 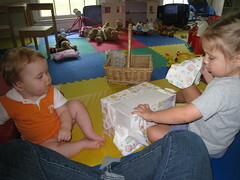 Here she got to play with blocks, read books, color, and listen to music. Sounds like fun to me. After quiet time, Anne Marie got to watch a special movie so Mommy could get a little College Gameday in while deep-cleaning the kitchen. Ellie ate a leisurely lunch to keep her contained. Movie and a banana left her thirsty so she got to have water with a straw and free reign to blow bubbles. Lunch was then served for Mommy and Anne Marie. 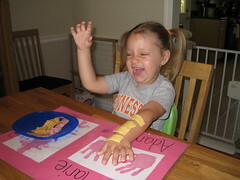 She had pieces of american cheese that she decided were bandaids - kinda gross to me, but that's ok. She put them on her handprints from her placemat and then on her own arm. Then she ate the bandaids off her arm. Ewww. She thought it was funny. Then on to some after-lunch reading time. I wish we had more of this delightful, dual self-entertainment on a daily basis. It didn't take too long for this scene to devolve into one of grunts, whines, "mines", and a little pushing and pulling. One day they'll get along perfectly, right? 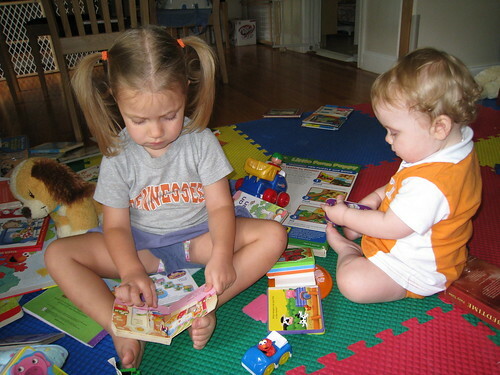 After it was discovered that Mommy was not in the playroom, I was summoned to read with them. We opened Gram and Papa's gifts (not sure why we had Ellie wait until Anne Marie's birthday for her gift, but it didn't seem to bother her). Discovering her gift, "Helping" to open Ellie's. 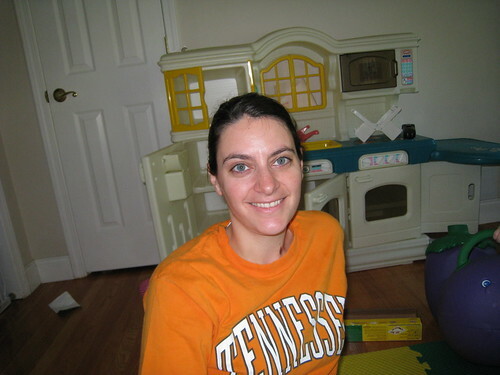 While Mommy put Ellie down for her nap, Anne Marie got to "do ABCs" on mommy's computer (the starfall website). Then it was off for naptime herself. 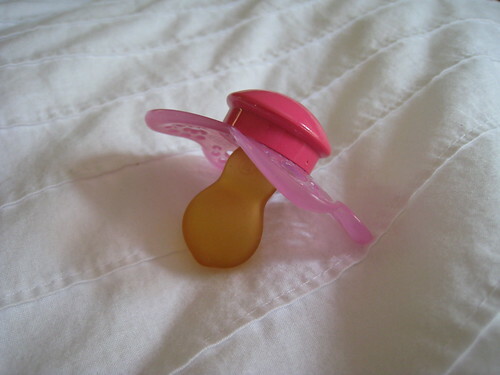 Since she's three today, she doesn't need her paci anymore (or so Mommy and Daddy say, at least). So with surprisingly few tears and delays, she fell asleep for her first intentionally paci-free nap of her little life. 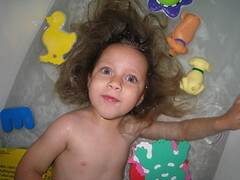 Mommy also finally got to do something about that greasy hair - ahhh, a shower - that's better! 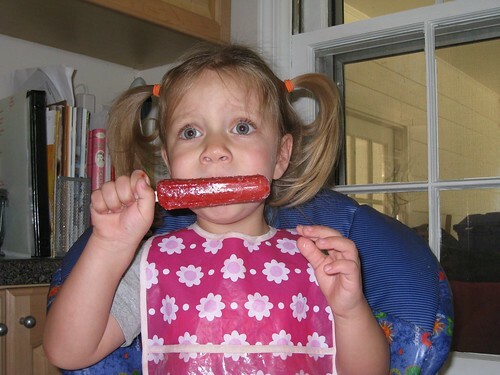 After a refreshing two hour nap (nice for Mommy, too), Anne Marie had her celebratory I-napped-without-my-paci popsicle proving that while three is too big for a paci, it's not too big for the high chair when a popsicle is available! 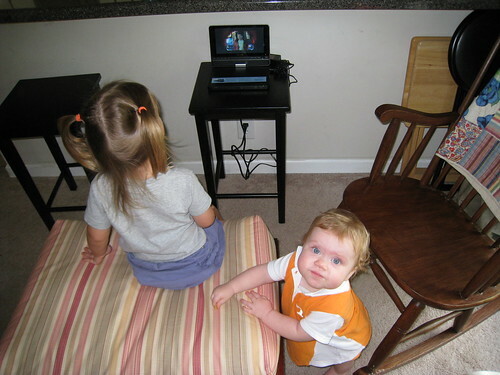 More special movie while Mommy watches the vols play. 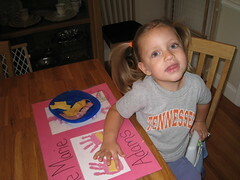 Some sad Vol watching later, and Daddy was home. Time to go to Anne Marie's choice of dinner. 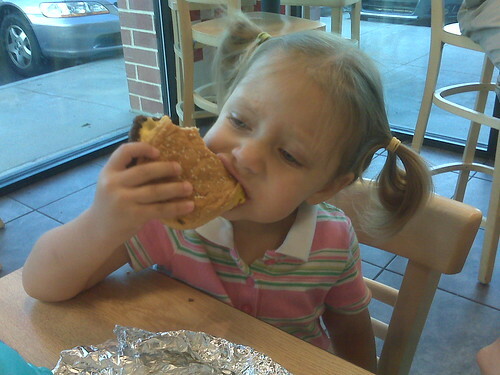 Cheeseburger at Five Guys followed by birthday ice cream, having already celebrated with cake and ice cream, cupcake-disaster strawberry cake and blueberry muffins - and as many parties with people to sing to her - we're keeping it low-key and low-mess today. ** I forgot my camera when I went out - super bummed about that. So these were with my phone. 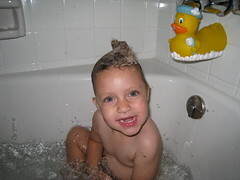 After practically mainlining sugar into her, we made it home for a quick bath. She was so hyper we allowed her just a few minutes of movie to encourage some stillness. We were getting her jammies on her when we noticed how big her belly was. 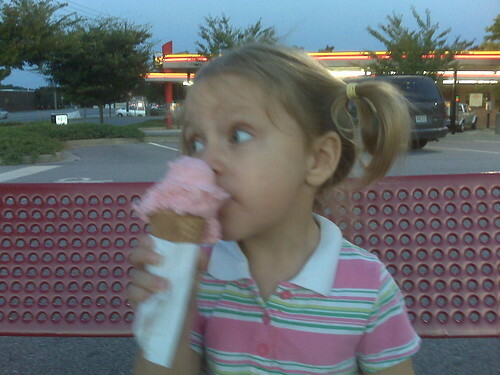 Between the big cheeseburger and the big ice cream cone, she had eaten a ton - I'm not sure when she last ate this much! 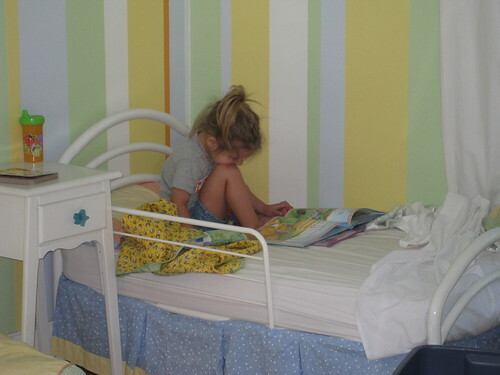 After her ten minutes, it was off to bed to read with Daddy. A quick snuggle with Mommy, a few last ditch efforts to get out of her bed, and she's down. There you have our day. Thanks for reading this far! Aside from those items or activities marked as "special" it was really not that much unlike many of our days. Anne Marie is transforming before our eyes. It's almost as if the change from two to three has been a switch. She's able to communicate and think about things in such a new way. I've been trying to put my finger on the changes. It's as if everything she could do two months ago has been amplified. Her ideas, conversations, songs, understanding, and abilities are just more, but in a way that almost daily causes me to stop and think something along the lines of "did she just do that" or "I can't believe she said that". She's beautiful - looking so much more like a little girl everyday, no more toddler chubbiness or awkwardness. She's loving and compassionate. She's good at pushing boundaries and trying my patience, but does love to please. She's making me find out so much about myself - some good, some bad, and some just plain ugly. I look forward to this next year and the discoveries it will hold for both of us. Happy Birthday to my sweet Anne Marie. Three years ago today I was holding a tiny, soft, beautiful girl in my arms and marveling that my journey as mother had begun. So much as happened in these three years that I feel as though the time has flown and yet, as I think of all the fun, joy, frustration, learning, discovering, consternation, and love that has taken place, time since Anne Marie's birth seems longer than time before her. I love you, darling girl. Wow! 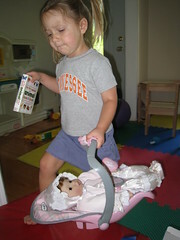 Brooke, what a fun day you gave your big girl. Will you plan my birthday for me (I want the room time with music playing and good books to read)? Your girls are so adorable and growing so fast! 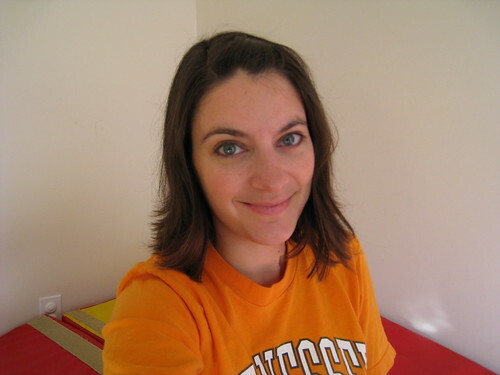 You look pretty gorgeous yourself, despite the orange shirt (yes, I said it, I hate the orange of our alma mater). What a fabulous day and beautiful post! Anne Marie, you've got a pretty awesome Mommmy there. Brooke! I'm so glad to know where you are online! I loved this post and look forward to going back and reading more. Anne Marie is precious. I love it when you do her hair in pigtails. What a great record you have of her third birthday.